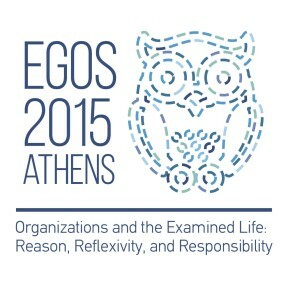 At the 31st EGOS Colloquium, July 2–4, 2015, Athens, Greece, I presented the paper Plurality of institutional logics in digital healthcare: The rise of the hybrid patient, co-authored with Gerardo Patriotta, Lorraine Pinnington and Sujatha Raman, sub-theme ‘Re-examining the Organization of Healthcare: Institutional, Technological and Clinical Challenges’. If you do not fancy the light reading of the paper, you find an abstract and the presentation below – with spoilers… or teasers?! Ok, here is a teaser: this paper features a few names and a few companies you may know if you are in Digital Health. It was a great event, with great speakers! I had the pleasure to meet in person Roger Friedland, one of the fathers of the institutional logics perspective (along with Robert R. Alford). What a superstar! In this paper, we explore field emergence, as it happens, aiming to enrich the theoretical understanding of this understudied phenomenon and of institutional complexity. Our inductive case study is the nascent field of collaborative digital health technologies, which we follow from 2007 to present. We employ an institutional logics perspective, and drawing on existing theorization of field emergence, we point out the complex intertwine of logics and stakeholders as they reveal in time. Although preliminary, our findings present four distinct emergence phases: ingenuous age, legitimation, mobilization and stabilization, along with particular aspects like the role of legitimizing actors and the granularity of the field during mobilization. Additionally, we discuss digital technologies as enablers and material mediators of institutional change, and highlight the emerging role of the hybrid patient, with practical implications for the evolution of healthcare, as we know it.